The second post in my PowerShell Beginner series, “Daily Tasks, The PowerShell Way“. Learn how to get network connection information and configure a static IP or DHCP using PowerShell. In my previous post we covered how to use Test-NetConnection for network connectivity troubleshooting. If you connected to a DHCP enabled network, you will likely have successful tests without any action on your part. However, if your network environment requires static configuration of IP addresses and DNS servers for servers and/or workstations, you need to configure the correct network settings for a newly provisioned computer. First, let’s see what’s connected. Get-NetAdapter will return basic network information. We see network connection “Ethernet0” is up with a speed of 1Gbps. We can use the cmdlet Get-NetIPInterface to get a summary table of our network interfaces and their connection state. Because I’m only concerned about IPv4, I include the parameter -AddressFamily IPv4. We can see that I have one physical interface connected “Ethernet0”, and it is currently configured for DHCP. We can use the Get-NetIPConfiguration cmdlet to return IP information for “Ethernet0”. We learn the IPv4 address, the default gateway, and DNS servers. One thing that is absent from this result set is subnet mask, hopefully that will be added in the future. However, we can get the subnet mask as a prefix value if we run Get-NetIPAddress. You can see PrefixLength is 24 (/24 or 255.255.255.0). PS C:\Windows\system32> Get-NetIPConfiguration -InterfaceAlias "Ethernet0"
You may want to set a static IP if your computer is a server or need to set static IPs in an environment without DHCP. You can do this using the New-NetIPAddress cmdlet. This is equivalent to opening the Properties of a network connection and manually configuring the adapter. If you configure a static IP address, you will also need to manually configure DNS servers for the connection. Use Set-DnsClientServerAddress. You can specify multiple DNS servers separated by commas. If you manually inspect the adapter, you can verify the static IP information and DNS servers are set. I can do this by running a sequence of three cmdlets, Set-NetIPInterface, Remove-NetRoute, and Set-DNSClientServerAddress. I will also incorporate Get-NetIPInterface and use piping to streamline the command input. 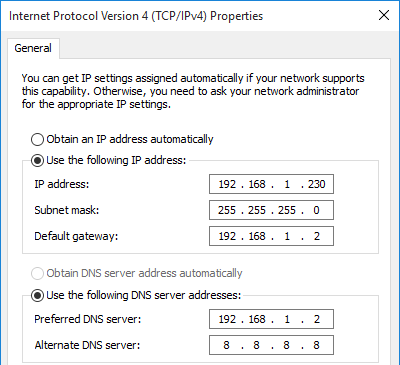 # Set interface to "Obtain an IP address automatically"
# Set interface to "Obtain DNS server address automatically"
The next time you are provisioning a server or workstation, use PowerShell to configure a static IP and DNS servers. If the computer ultimately should use DHCP, use PowerShell to remove the static configuration and revert to DHCP. I have a Win10 Home pc that I want to add to my home network. I have reserved IP address 192.168.1.115 on my router for that MAC address. It keeps reverting to 192.168.15.2 and gateway 192.168.15.1. I have done the standard ipconfig /release…/renew, even forcing winsock and int ipv4/v6 resets; and I uninstalled the NIC, all to no avail. That sounds like an odd issue. You don’t have more than one DHCP server running on your network, do you? And you verified the adapter is configured for DHCP?